TORONTO, ON – Great Lakes Brewery has announced that it has brewed the official beer for the 2018 edition of Toronto Beer Week. 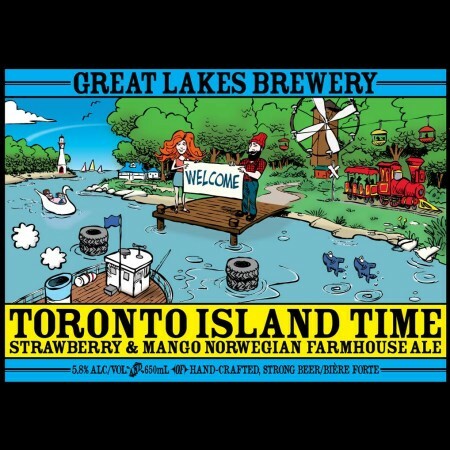 Toronto Island Time (5.8% abv) is a Norwegian-style farmhouse ale flavoured with strawberry and mango. The beer will be launched this Friday September 14th at 4:00 PM at Summerhill LCBO in Toronto, where samples will be served along with food from The Wavy Wall Craft Kitchen. Mayor John Tory will also be on hand to officially launch Toronto Beer Week. Toronto Island Time will be available in 650 ml bottles at Toronto LCBO locations. Toronto Beer Week 2018 runs from September 14th to 22nd at venues throughout the city. For more details, see the TBW website.